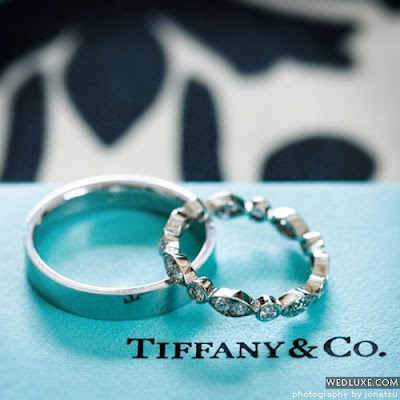 On 05.31.08 WDS has the pleasure of designing the wedding of Tanya & Jure's Dreams. The exquisite event, made its appearance in the newest addition of Wedluxe, Canada's premier Wedding Magazine. “Elegant with a splash of glam,” is how Tanya and Jure describe their Vancouver wedding which was designed around black and white damask. The couple incorporated the damask motif throughout the entire day, starting off with a custom logo by graphic designer Jessica Boffo of Kardz Kouture. Boffo also created all of the stunning stationery used throughout the wedding day. Tanya—an interior designer with Earl’s Restaurant wore a custom off-white modified trumpet shape gown by Something Blue. The gown was covered in Alençon lace and featured an oversized (12” flower) at the waist. “The flower was my favourite part—it was dramatic and bold,” recalls Tanya. She accessorized with a vintage crystal cuff bracelet found at a vintage store in Las Vegas. Tanya’s “something borrowed” was a sparkling beaded clutch which belonged to her mother. Jure wore a classic black tailored one-button Hugo Boss tuxedo and striking black and white cufflinks to complete the ensemble. A collection of designer flasks were presented to his groomsmen. The flowers by Vivio Flower Gallery were also a study in black and white. Tanya carried a cascading bouquet of white orchids while her bridesmaids each carried one singular ‘Avalanche’ rose—built up with a cluster of petals to create the illusion of one oversized bloom. Each bouquet was then punctuated with a cluster of decorative black feathers. The Villa Amato set the stage for a grand black and white reception with no detail overlooked. 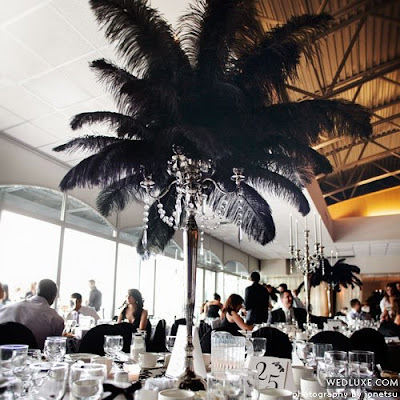 Large feathered black centrepieces and yards of black & white damask filled the room, designed by Wedding Design Studio. Guests enjoyed a myriad of treats, including an outdoor martini bar with custom cocktails named after Tanya and Jure’s favourite cities “NYNY” (New York) and “LALA” (Los Angeles). After a wonderful meal catered by Orlando’s, each guest could enjoy a custom coloured marshmallow by Butter Baked Goods. The three-tiered strawberry shortcake tuxedo cake was described by the bride as “sleek and chic.” It was created by Darleen’s Cakes who also provided the monogramed cookies which each guest took home. The couple honeymooned in Bora Bora and Waikiki. They now reside in Vancouver.